So you’d like to introduce your son, daughter or new friend to the outdoors? This can be one of the most gratifying feelings of your entire life. Taking a kid out just once can change their life in more ways than you think. Here are a few alternate activities to get a person involved in the outdoors, which is not solely based on the actual hunt itself. Check them out! Cultivating a beginner’s interest in a family-friendly food plot excavation can be a thrilling activity. Toss them a rake, hoe or a shovel and let them have at it! Let them sprinkle the seeds, remove debris and interact with what it means to be a farmer. This is an opportunity for you and your new sidekick to indulge in the magical beauties of planning, prepping, planting and watching your very own hunting plot sprout! Kids don’t seem to fully grasp or realize the efforts put into establishing a lush green plot, but getting their hands dirty teaches them the value of hard work. Watching that hard work turn into the tall, green, leafy plants that you hoped for really defines the experience. Trail cameras are perfect tools to share with kids, and your whole family. Have the child help you scout for locations to mount the cameras, and then help you set the units up. Take them back to retrieve the images and swap out memory cards or batteries. Then share in the excitement of finding out what incredible shots your game camera has captured. Game cameras really get kids, and adults, excited about the outdoors and wildlife. You never know what kind of pictures you are going to get. It is an activity you can share all year, every week if you choose. Tree stands may be a little out of reach for your new scouts, literally. Give them something fun to do such as concealing a tent blind. As spring approaches and the snow melts, our minds will be set on turkey-mode. This is primetime to set up a blind somewhere in the woods, along a field, or in a pine thicket where turkeys roam back to roost. Take your handy hacksaw and hack-off a few limbs for your partner to lay across the blind and have them try to turn it invisible. To be quite honest, I have just as much fun dressing the blind with limbs, grass and leaves as a novice would. To keep their attention, bring an antler for them to find while you’re out there, because sometimes it can be like walking through a barren desert. The key is to keep their attention, make it enjoyable and keep the pace. There’s no greater feeling than hammering on an owl call and listening to the woods ignite with the shrieking thunder of a Tom turkey! Listening to a revved-up gobbler is one of the best sounds I can think of. This is an activity that’s quick, painless and oftentimes a guarantee for quick results. Make sure you tell your son, daughter or newcomer why a turkey gobbles and what you are doing and most importantly, why you are doing it! Let them give it a hoot and have those birds roosted for tomorrow morning. I’ve heard it time and time again, there’s nothing better than feeling like you’ve accomplished something. Sharing an outdoor experience with a child doesn’t always have to be hunt-based. Show them there’s more to hunting than what meet’s their eye. Give your trainee an experience they’ll never forget. Man, what a year it’s been. I’ve somehow managed to end up with five Moultrie trail cameras. The battery life on these cameras is great. I have them set up for video mode at 30 seconds a pop and, in some cases, multiple still pictures in enhanced mode. Most nights I’m getting an average of 30 and as many as 100 pictures and videos on a single camera!! I have not seen another trail camera on the market today that conserves batteries and does as much as the Moultrie Game Spy cameras. Although the average battery life on the cameras is 150 days, I’m like all hunters and want more. So I started looking into rechargeable batteries. However, when I checked the Moultrie website I found one of their newest products. They now offer the PowerPanel that works with all of their 2007 and later trail cameras. When the PowerPanel is plugged into the camera, it is designed to run off of the power source that has the highest charge. 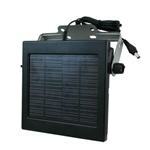 Throughout the day, the solar panel on the PowerPanel charges the built-in 12 volt battery. During long periods of overcast or rainy conditions, the camera will automatically revert to running off of the D-cell batteries that are in the camera until the charge on the PowerPanel is built back up. This unit ensures a continued source of power to your camera for who know how long. The PowerPanel features a menu with a digital readout that displays an array of information such as the state of charge of the internal 12 volt battery (Internal Charge Level) and the Real-Time Solar Value, which tells how much direct sunlight is getting to the panel. The Real-Time Solar Value is helpful in aiming the solar panel to get the best shot of sunlight. The readout also shows the daily and weekly solar averages. Because the whole purpose of the PowerPanel is to use sunlight as a power source, you must put it in the sunniest place you can find around the camera, which is easy to do with the aid of the LCD readouts and the 10-foot cord that connects right to the camera at its base. The unit comes with a couple of screws to attach the swiveling base to a tree, but I reasoned that the tree trunk itself would eventually cast a shadow and block the sun from the solar panel. I looked around, found some scrap lumber and made a simple mount that would allow me to place the PowerPanel away from anything that would cast a shadow. This also allows me to aim it in any direction I choose. Here are a few pictures of the construction of the mount. It consists of a vertical 4-ft long 2x4 that has a horizontal 2-ft long 2x4- attached at the top at a 90-degree angle. A 1-ft long 2x4 cut at a 45-degree angle on each end makes up the brace between the two. I dug a small hole 1-ft deep in the ground and put the vertical post in. I simply packed the dirt back into the hole around the post and it was done. This was an easy solution to mounting the power panel away from shady areas and it took just about 10 minutes to make it. Get yourself a couple of these new PowerPanels for your Game Spy cameras (2007 and later models). It’s the latest technology from Moultrie. They are always finding a way to help hunters enjoy their sport even more. You will find yourself going to buy batteries and disturbing your hunting area a lot less because of it. Thanks Moultrie for another great product! One of the most common mistakes that hunters make is providing supplemental feed only in the fall. Often times, many quality food sources are depleted by late winter. Starting supplemental feed programs from the end of the rut through the time when your spring food plots come in can give you a head start on building a healthy deer herd. By providing deer with high–quality feed during late winter and early spring, and maximizing protein levels during these periods, you will ensure optimal body growth and antler development. Another advantage to using feeders in late winter and early spring is that deer season is over. Deer are looking for food; feeders will help draw local deer to your area. Using game cameras in conjunction with a feeder allows you to easily inventory your herd, determine what bucks to hunt next season, learn the time and the date of the sightings, get a good idea of your buck-to-doe ratio, and find out how many deer come to your feeder each day. Begin your supplemental feeding now; it will increase your chances of growing the quality bucks that you want to harvest next season. The past 8 months I’ve been working diligently on a project that means more to me than hunting, fishing, or writing ever will. I am so fortunate to be able to work in the outdoor industry and promote it through mass media avenues such as television, publications, and the Internet. My niche in this industry not only as a hunter, but a person who cares about the longevity of our sport, is to make an impact on kids’ lives. 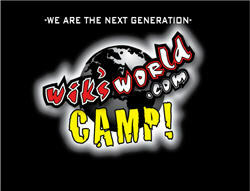 To do this, I’ve established an exclusive outdoor camp for kids, called Wik’s World Outdoors Camp. Wik’s World Outdoors Camp defines what it means to pass on the great hunting tradition to the next generation of outdoorsmen and women alike. We set the standards for integrating the components of values, morals and ethics of the outside world into a kid-friendly approach. Displaying instructive examples, hands-on learning and educating the basics of outdoor skills in an interactive way is what we do. It is our duty to be role models & take a leading edge idea and craft it into a youth's perspective; teaching the novice hunter of today for the expert hunter of tomorrow. This is my mission. I can’t talk enough about the importance of taking a kid hunting or fishing. It is a statistical fact that kids from age 2 – 11 have already been exposed to more than 20,000 advertisements, on television alone! All this superficial junk, persuasion, and obscenity creates a mental block within a child’s growing mind. Instead planting kids in front of the television set, give them something interactive to do outside. By age 14 kids have already been immersed in so many activities that it truly takes on the statement, ‘You can’t teach an old dog new tricks’. It’s difficult to drag a kid back into the deer woods if they grow up not having an interest in the first place. License sales are down, hunting numbers are plummeting and this is a growing problem within the industry. I literally feel disgusted by that statement, which has been blared so many times. When is there going to be a difference? Instead of shying away from the fact, we must face it and stand proud for our passions in life. We need to role model as students, fathers, and mothers and take the initiative to make an impact on someone’s life. Be a better person and express yourself with the basic principles of respect, leadership, and determination. That is what we preach at Wik’s World Outdoors Camp. With this new endeavor of mine lifting-off the ground, I hope to influence as many kids as possible by educating them and letting them experience the outdoors in a fun way; in a way that they’ll never forget. If we start kids out early demonstrating the pleasures the outdoors offers, we can be assured our children and grandchildren will have a tree to hang their stand on. The development of digital game cameras has revolutionized the way that many people hunt. Cameras allow you to see what is on your property and also help you pattern the game that you are after. Battery life has always been a priority to game camera users. It is important to keep your scent out of the woods and travel to your hunting sites as little as possible. The development team at Moultrie realized the need for an external power source that would extend battery life in their 2007 and later Game Spy models. The Camera PowerPanel is the latest, and most anticipated, game camera accessory by Moultrie. At first glance, the PowerPanel resembles an ordinary solar panel that charges the camera’s batteries. As we all know, looks can be deceiving. The PowerPanel is actually a self-contained, external power source. It features innovative software that combines a solar panel and built-in 12-volt battery to extend camera life in the field. The LCD screen displays real-time solar value, as well as daily and weekly solar averages and internal charge level, allowing you to mount the PowerPanel in optimal sunlight. When the PowerPanel is charged the camera will pull its power from the PowerPanel and not the batteries, allowing the batteries to remain charged. In the case of lowlight conditions, the camera will automatically switch back over to the camera batteries until the PowerPanel recharges. Using the PowerPanel will help diminish the need to frequently change out batteries and disturb your hunting area. Moultrie’s PowerPanel is weather resistant, includes a 10-ft cord allowing for optimal placement and is compatible with all 2007 and later Moultrie camera models. The drought of ’07 that affected most of the Southeast will have long lasting effects. Lakes that never get low or go dry DID. Georgia is still battling Alabama and Florida over the water that comes from our state. In the woods I noticed many trees were so stressed out from lack of rain that they went into a dormant state and began sap reduction. Sap reduction caused their leaves to take on fall colors and start dropping two months before they should have. God only knows what effect this will have on them going into this spring, summer and next fall. I also witnessed changes taking place in persimmon trees. The fruit literally dried up on the tree like prunes before it even fell. The acorns also fell earlier than usual. Everything in the woods, both plant and animal, suffered from the heat and effects of the drought. In my own yard, deer were hitting anything green and tender that they could find. My wife put out a hit list on a group of deer that completely wiped out all of her HOSTAS that surround a nice island in front of our house. My wife was ticked to say the least. I just hope the plants come back this spring. On a side note, I used a trick that I found years ago to keep the deer from coming back. I took bars of Irish Spring soap and notched it where I could tie a string so it wouldn’t slip off. I tied these very strong smelling soap bars up in the trees that surround the island. I guess the strong perfume-like smell kept them from coming back. A few years ago I actually got permission to hunt on a ladies farm because her flower garden was being destroyed by deer. They descended on everything including hostas, rose bushes, monkey grass, day lilies, hydrangeas and tulips. This poor lady wanted to pay me $25.00 for every deer I could harvest! For the next two years I filled my tags at her place. When nature takes a hit because of the weather, the down stream effect often is dramatic. Deer get hungry and show up in places you would have never thought possible. They do odd things too. When the deer would show up at the ladies garden, her husband would get a shotgun and shoot up in the air to scare them off. They would run just out of sight and as soon as his front door closed, they came right back. I remember asking the lady where would be a good place to hunt. She told me to sit on the front porch!!! This past weekend I checked a camera that is watching a feeder in my back yard. I was stunned to find 62 pictures taken in one night. On my way to check the camera, I saw skid marks and signs of deer running in the chewed-up grass and in the dirt. I thought that something strange must have happened for deer to have been running full blast and then skidded to a stop like that. At first I thought coyotes were the cause. When I checked the camera though, all became clear. By now, deer around here are in survival mode and are just trying to get by until spring. Food is hard to come by and there just aren’t enough groceries in the woods left to go around. Any kind of food is at a premium and deer will do almost anything to get it, EVEN FIGHT!! When I checked the pictures taken on my Moultrie M-60, I couldn’t believe my eyes. On three different frames, bucks were fighting at my feeder. On two others, a small long-horned spike was showing aggressive posture toward another buck at the feeder. The hair on his back was bristled up with ears laid back and his head low. He meant business. I think they were all fighting over a food source plain and simple. They are hungry and no one wants to give up their place in line. Check out these rare pictures in the middle of February. Since then, I’ve put an additional I-60 out at another angle that will take five-second video at night. I’m hoping to catch another fight on film. This passion hunters have is a never ending learning process. If someone had told me that they saw bucks fighting during the middle of February, I would have thought they were nuts. Once again because of the help of these wonderful tools we all have available to us, our eyes are opened to more important information than we ever thought possible. I don’t think I’ll ever get tired of being amazed at whitetails and what they do. Get yourself a trail camera and you too will be amazed at what you catch in the act. Last week, I discussed prepping for the ’08 season and touched on Outfitter hunts. In this week’s entry I describe the research I do before booking hunts. So you’ve stumbled upon last month’s hunting magazine and notice a big buck photo, phone number, maybe a website and that bolded word “Outfitter,” what do you do? I’ve heard and witnessed cases, including my own, of people who have been chewed-up and spit out when it came to the experience of an outfitter that promised it all: fine dining, comfy accommodations and, of course, off-the-charts hunting. With a few dozen stories, a couple firsthand experiences and the utterly-miserable time spent, here’s a thing or two to consider before booking your next hunting adventure. I cannot describe how important it is to do your research! Whether it’s before a test or your next job interview, you have to research and study. Take a nibble before you decide if it’s appetizing. The same is true with researching an outfitter. When you find an outfitter, be sure to ask them for at least six references. Ask for three successful and three unsuccessful hunters’ phone numbers or email addresses. I usually contact about ten clients before making my decision. You shouldn’t feel awkward or sense that you’re asking for too much ‘pertinent’ information. This is your hunt; this is your right, and most of all your hard-earned greens. Be sure to speak with each client and ask questions that may concern you. It’s not a proven fact by any stretch of the imagination, but a subtle clue I’ve used to make choices in which outfitters are legit and which ones are iffy is by looking at their website. Websites are extremely important in marketing yourself and the fact is that they’re only going to get even more crucial. I believe a website speaks in volume. It declares what type of personality you have, how professional your business is and details it within the photo gallery of harvest shots and live trail camera pictures. Usually websites that are well structured, error free and have a great sense of appeal dictate a percentage of whether or not I decide to keep the outfitter in mind. Lastly, the most important aspect of scheduling a hunt is actually talking to the outfitter and feeling him out. If he sounds enthused, willing to send information, pictures, and a list of past hunters’ references, then he’s probably a great candidate. It’s crucial that you ask questions, make comments and arrangements prior to your hunt dates. The more you plan, the better. Oftentimes, I will make calls a year in advance to assure a reservation, feel the outfitter out and give it another year as a prospect to see what was shot, missed and photographed. Selecting a good outfitter doesn’t always have to be trial and error, but sometimes being foolproof can be impossible. If you do decide to invest in an outfitted hunt it is your job as a client to hunt outfits first, animals second. Don’t miss Moultrie’s 4th Annual Closeout Sale! Moultrie is making room for new and exciting 2008 products with sale prices up to 60% off. Also, until Friday you can save an additional 15% on all closeout purchases. This is the perfect opportunity to stock up on great Moultrie products like 30-gallon tripod feeders starting at $59.50 or, just in time for spring, Moultrie’s 15-gallon FeedCaster fish feeder for $135.99. Hurry, supplies are limited and will not last long. Now that deer season is over, I feel overwhelmed with everything I need to do and want to do in the coming months. There are so many things on my list that my head is spinning like Linda Blair in “THE EXCORIST.” I really wish I had the luxury of more time. Since I don’t, I have to cram as much as I possibly can into my weekends. Right now I’m having a hard time keeping my mind on any one thing. I’m in the middle of my post-season scouting and still have more ground to cover. I’ve found some new funnels that I didn’t know about. I’ve also found new scraping areas with plenty of white oak trees for deer to feed under. I’ve marked a few places with surveyor’s ribbon, and on my topo map for further investigation. I’m not finished searching yet. It takes time, energy and lots of foot tracks on properties I THINK I know well. I’m always finding new places. Man, if I could only retire right now so that I could dedicate all of my time to this. Post-season deer scouting is the perfect opportunity to prepare for turkey season. While I’ve been scouting, I’ve also been looking for turkey scratching, droppings and feathers. Even now, if you get into the woods about daylight you can hear hens fly down and give a cackle on the way. Hearing this is a good way to pinpoint favorite roost sights. Our turkey season opens on March 22nd. I’ve got some new shells to try in my shotgun as well as a new choke to see how it patterns. I’ll talk more on patterning my gun in another entry. I love turkey season. It’s so much fun to hear a Gobbler and know he’s responded to my calling and is on his way. Between deer and turkey, my son always preferred turkey hunting. He loved hearing them fly down and start calling. That’s what really got him going. This year I’m going to try to get him into the woods again for the first time since his brain injury that changed his life. I’m looking for a ground blind with a floor in it big enough for me and my son in his wheel chair to get in. Hopefully, getting him back into the woods again will do wonders for his rehabilitation. He needs to be able to once again do those things he and I loved to do together so often before he became disabled. Aside from scouting for both deer and turkey, I’ve been trying to take down my tree stands. With my wife’s help I’ve gotten a couple down. Like I said, just not enough time. It’s important to get them down not only for repair and to keep them from rusting, but the varmints will get a hold of them if they’re left in the woods too long. You have to protect your tree stands from squirrels, raccoons, opossums and especially the two-legged varmints who love to help themselves to stands. I’ve also been busy taking soil samples and applying lime with my new Moultrie ATV broadcast spreader. It works great and has a remote control slide gate that, with a touch of your finger, lets you open up the gate as little or as much as you want depending on the kind of seed, lime or fertilizer you’re spreading. It was easy to set up and mount on my electric golf cart. It plugs right into a cigarette lighter and you’re in business. The motor is so quiet that you can’t hear it running at all. I really like it. It is another one of those tools that makes the chore of planting food plots and even liming or fertilizing your yard or garden a pleasure. Now I’m finished in a third of the time that it took me with a handheld spreader. There is still so much to do! I’m going through all my hunting gear and putting it in scent-free containers. I’m separating other hunting equipment that I tried and just didn’t measure up. I’m tuning and practicing for 3-D archery shoots. With all that I have going on that’s deer and turkey hunting related, and with all the planting I have ahead of me, I think I’m going to put my two-day notice tomorrow - that means I’m quitting TODAY!!! A guy has got to have his priorities….RIGHT???? Well, at least I have some vacation coming to me (and a few sick days). Matter of fact, I’m feeling a little sick right now. I’d better go ahead and call in so I can be in the woods at first light. Next week I’ll continue with what’s ahead - getting ready for springtime planting, turkey season practice and some new equipment I’m using and how it works. I’ve got to go, daylight’s burning. Here we sit stagnant in the early days of February, without anything to chase, hunt or shoot. This is my time for research data collection, which is just fancy for investigating different places to hunt, new properties to scout and filling my calendar with of hunting dates, trips and adventures for 2008. A very hectic, mind-numbing ordeal for someone like me, who can barely plan what to eat for dinner! I urge hunters to plan ahead of time before venturing on an outfitted or guided hunt. It’s important to research where you are going, the tag situation, the price being charged, how much the total expense will be, etc. Remember, this is your hunt. You must treat it as your vacation. It can be considered like this: Do you want to dish out a few Benjamin’s and experience a family vacation to the nearest town? Or do you want to make a solid investment and make the trip worthwhile? Hunting animals you never pursued, trekking land that you’ve never thought possible - a hunting experience is only as good as you make it. When shooting footage for our show, I usually keep a solid mix of outfitted hunts, regular ‘backyard’ hunts on my property and on small parcels of land owned by friends. I’ve usually scouted, hung stands and put forth an enduring effort to make a perfect scenario evolve out of that ideal stand setup for hunter and videographer. The factor that slams the hammer on video hunts is that there’s only so much time to spend at that particular place. A six-day hunt turns into a solid four-day hunt, taking into account two travel days. This makes it awfully tough to kill anything, when at times people hunt the entire season (three-months) just to kill one buck! Take into consideration bad weather, heat, rain, snow, and now you’ve got yourself wrapped in a root! These are just some of the obstacles that play out when hunting. Mother Nature is an uncontrollable variable. Outfitted hunts are never a ‘gimme.’ As many people happen to believe, outfitted hunts are simply a property that hasn’t been pressured, has a solid management program and most importantly has great stand locations to intercept deer. It’s never a 100% guarantee, which is why we call it ‘hunting.’ Believe it! I went on a few hunts this year where we didn’t even see a shooter, let a lone a buck within 300 yards. I also went to Colorado and hunted, where we did see a lot of monster bucks, but I couldn’t seem to hit the broadside of a barn. Many factors go into the moment of truth blossoming in front of your eyes. People who are interested in hunting with an outfitter should do their research data collection by making phone calls to references, checking their website, looking at the amount of land held by the outfitter and so much more. I will continue next week’s blog in the actual research I do before booking a quality hunt. This could spur ideas, plans and possible key questions you may need to ask yourself before booking an outfitted hunt.